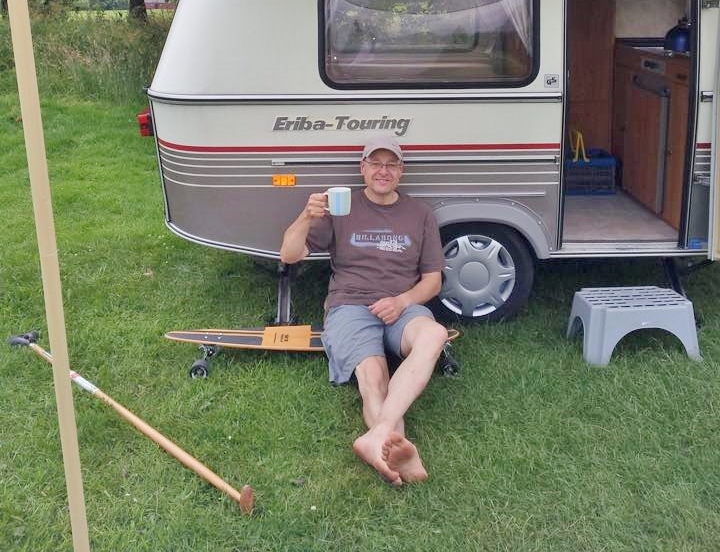 Gary Evans, owner of Land Paddle UK, is pretty much the reason land paddling touched down on UK soil. With ever increasing popularity, and not just among watery SUPers, land paddling offers a great crossover appeal as well as something unique for those already into the art of longboarding. We catch up with Gary to see what made him think land paddling was a winner and where he sees the sport heading. Tell us a little about your background – any previous experience in board-sports? I’ve had a bash at most board sports over the years, I learnt to snowboard when the Snowdome opened in Tamworth and had a good go at breaking bones on my mountain board in the 90s. Lad surf trips to Newquay and Bude in the 80s got me hooked on bodyboarding and I still use my Morey boogie board when I get chance. I’m old enough to have been around when skateboarding took off in the 70s so that’s when I first started riding concrete. Can’t remember what make the board was but it had a flat wooden deck with clay wheels and it shook every bone in your body. It was the mid-2000s when I took it up again (midlife crisis) but it was short lived. I had problems with my Achilles tendon and pushing was agony. The longboard therefore was retired to the back of the shed. When did you first become aware of land paddling and what made you think it was a good idea to start a business surrounding it? I was on the net looking for somewhere to do a SUP taster session about five years ago and came across a Kahuna Creations video. I got really excited about this new way of riding so the longboard came out of retirement – I gave it a go and was instantly hooked. A few months later I found out that one of the first UK SUP clubs – Central SUP – had just been set up by Chris Kenyon and Scott Warren in Tamworth about 15 miles down the road from me. By this time I had started building prototype kit so I took a land paddle and longboard over and met the guys. They had just started using similar kit and were really enthusiastic about it. Scott took me through my ASI SUP course which got me hooked on SUP and we could all see the crossover benefits between land and water paddling. Chris and Scott’s enthusiasm made me think that land SUP could take off so I decided to set up Land Paddle UK. How was it at first? Was it tricky convincing people pushing themselves round with a pole was a good idea? I’m sure lots of people thought I was nuts when I first started – some probably still do. Anyone who land paddles knows that you get funny looks and comments every time you’re riding, but you can use that to open up conversation and get random people giving it a go. Most are surprised how easy it is to get the hang of and how much fun it is. When a few people in the SUP community got involved it gave the sport a little bit of credibility and things started to take off. What type of kit did you start your land paddle journey on? How has equipment evolved over the last few years? I started out with a Bulldog Longboard I had for a few years and a makeshift paddle cobbled together with bits from the work shop. Then I began to build my own longboard decks and land paddles, experimenting with different road grips along the way. Equipment has evolved quite a lot over the last few years. Kahuna Creations have brought out land SUP specific boards that are quite unique and aim to mimic stand up on land as much as possible. KC are on their 4th generation of road grip so equipment is improving as the sport grows. Hamboards and Kahuna Creations have developed a range of boards to suit most riding styles and the guys at Sk8pole have developed an alternative pusher grip that is also used by Hamboard. We developed our own UK made “SK8Paddle” brand in 2011 and it’s been really popular. We’re working on another model right now. Talk us through your current set up and why you’re using these particular pieces of kit. What do you like about your personal equipment? I’m spoiled really because I get to use a wide range of kit when we run demos and events. I always have in the van/car a Kahuna Blackwave Dropdeck though. It’s nice and low to the ground, carves beautifully and is compact enough to lug around easily with a KC adjustable paddle. If space isn’t an issue I use a Kahuna Bamboo land paddle. They are light and I love the flex in the shaft. After trying all kinds of road grips over the years the latest KC Road Blade is my favourite. How did your involvement with Kahuna Creations come about? What do they offer to land paddlers and why is their kit highly regarded? Do you stock any other brands? If so, which ones? I had got everything ready to go with my own “SK8Paddle” brand of paddles and boards and I had already started selling my own kit but then ended up talking to the guys at Kahuna. They asked me if I would like to represent and distribute them in the UK. When we got our hands on the KC longboards we decided to shelve our own decks and concentrate on promoting the whole KC brand and our “SK8paddle” land paddles. Kahuna Creations were the ones who took the idea of stand up paddle boarding from water to land and developed specific products to try and mimic SUP on land. They continue to improve on design which helps keep them ahead of the game. KC products have evolved and improved over the years – they perform really well and look great too. We started working with Hamboards, Sk8pole, Revenge Trucks and Onda Boards in 2015 and have a number of changes planned in 2016 with some new partnerships. 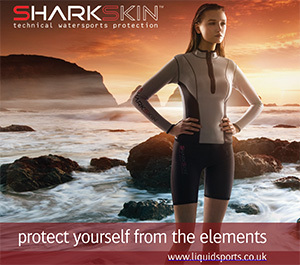 What’s the most popular product you sell through Land Paddle UK and why do you think this is? By far the most popular product we sell are the Kahuna Creations adjustable land paddles. I think this is due to the price point and convenience of having a compact paddle for transport. What’s your opinion of the other land paddle gear on the market in the UK? There’s a considerable amount of cottage industry custom/semi-custom boards available. Do you see this as healthy? I think it’s fantastic how land SUP has started to take off in the UK and the fact that people are experimenting and trying to develop new ideas can only be a good thing. I’m personally always trying out new materials and shapes. There are some beautifully crafted, innovative boards being designed which all bring something to the party. I try to ride as many as possible at meet ups. We need to keep developing new products and ideas to keep things fresh, push the sport on and keep the big brands on their toes. Talk to us about the land paddle events you’ve organised in the past. Any intention to do more in 2016 – if so can you tell us any details? We have been at Paddle Round The Pier in Brighton for the last three years which has been a great event to promote land SUP. David Samuel who organises PRTP and Brighton Sport Relief invited Chris Laing from Brighton Land Paddle and Land Paddle UK to organise a land paddle race as part of Sport Relief 2014. There was a good mix of people and skills with a lot of stand up paddlers from all over the UK turning up making it a fantastic day. We are hoping to do it all again in 2016. I’ve also done a load of event days with the guys at Central SUP and lots of smaller youth events and school events. For the last two years we have been at the South Coast Roll at Goodwood race track and this year saw a really good turn out of UK land paddlers. It’s a great chilled out family event and I can’t wait for the next one. Do you see comps and events being a big draw for UK land paddlers? As the sport grows I think there will be a demand for comps, distance trials and more land SUP specific get togethers. It’s still really early days for land paddling but as more stand up paddlers get involved you might see land SUP racing getting tagged on to SUP events – who knows? How do you think land paddling compliments SUP on the water? Is it a viable cross-training tool? I know there are mixed feelings out there about the cross over benefits of land paddling, but the feedback I get from stand up paddlers who play a very active part in the UK SUP scene is really positive. The fairly recent development of land SUP specific longboards that enable you to ride in a side by side SUP stance and transition into a surf SUP stance mean that land paddling is now as close to SUP as possible. A number of riders are honing their SUP surf skills on a skate ramps before hitting the water and are praising the benefits. The main thing is that you can keep a land paddle and longboard in the car or van and have a quick session almost anywhere at any time so you get a SUP fix when you can’t get on the water – that’s got to be a winner. We know you have a couple of team riders on the books. Who are they and what do they offer Land Paddle UK? Tati Coco SUP joined us early last year and is a fantastic ambassador for stand up paddling and land ladling. She is so passionate about all things SUP and a great role model for young girls wanting to get into paddling and adventuring. We love having her as part of Land Paddle UK and the Kahuna Creations team. Alan Taylor from SUP North has been working with us for a few years now and he has pioneered land paddling as a credible crossover aid for SUP surfing. He lives for SUP and is constantly developing new ways to improve his SUP surfing using land paddle techniques. Alan has been (and still is) an invaluable part of the team. What do you think is the next chapter in land paddling’s story? Where do you see the sport’s progression? I just hope it keeps growing in popularity the way it has over the last 4-5 years. Land Paddle UK have introduced a lot of people from other sports to land paddling and it’s been really nice to see them go on and become involved in the UK SUP scene as a result. I hope that more people get the SUP/land SUP bug and eventually there will be enough demand for a race series and larger land SUP events. Any final shout out s and thanks? Massive thanks to Chris Laing and family for his support and organisation at all of the Brighton events and to Jon and Tom Rimmer, Simon Jeffery, and Barbara Willits who helped out for free and have helped promote LPUK. 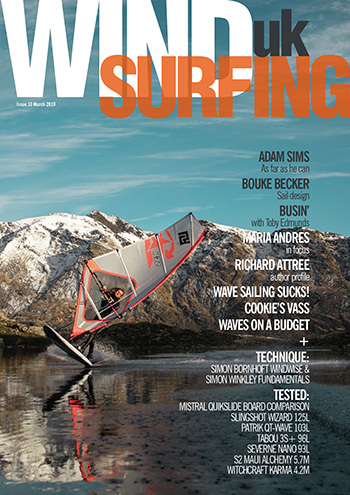 Chris Kenyon and Scott Warren also deserve a mention for getting me started in the world of SUP. 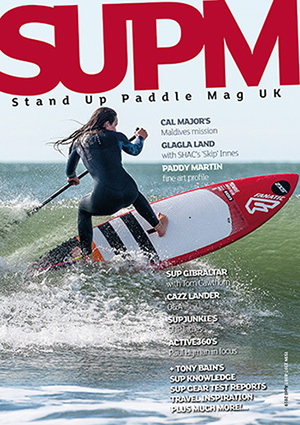 You guys at SUP Mag UK for covering the sport over the last 12 months or so. Finally thanks to all of the people who might not be directly involved with Land Paddle UK but have promoted land SUP over the years and helped to grow the sport – you know who you are. I hope to see you on some silky smooth black stuff really soon.